“Mommy, can we please cook something today!” Were the first words that came of out my three year old this morning. “Of course, my dear!” I said ” We still have that pumpkin that we took all the seeds out another day. 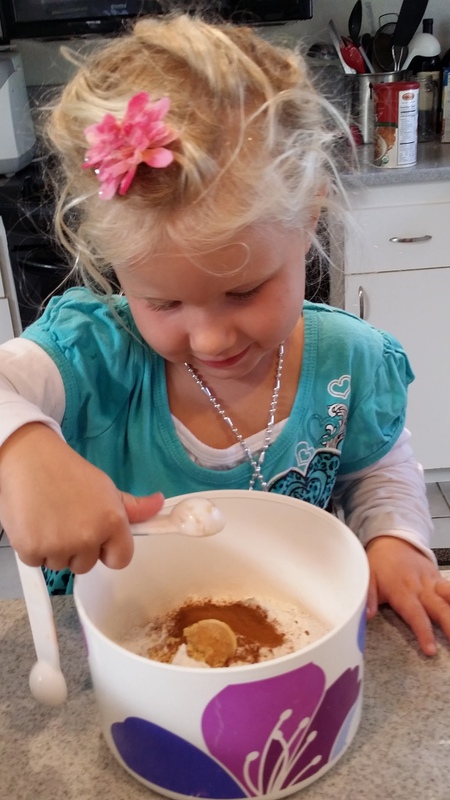 Let’s make Pumpkin Muffins!” I have an old recipe that I use every fall and people love it. It requires fresh shredded pumpkin and oat flour. The muffins come out healthy, clean and delicious. After you cut your pumpkin in halves, take all the seeds out, slice it, like you slice a water melon. Then, take each slice and peel off the skin with a potato peeler or a knife. Once the skin is off, you shred it with food processor or by hand with a shredded. You will need about 3 full cups of shredded pumpkin. 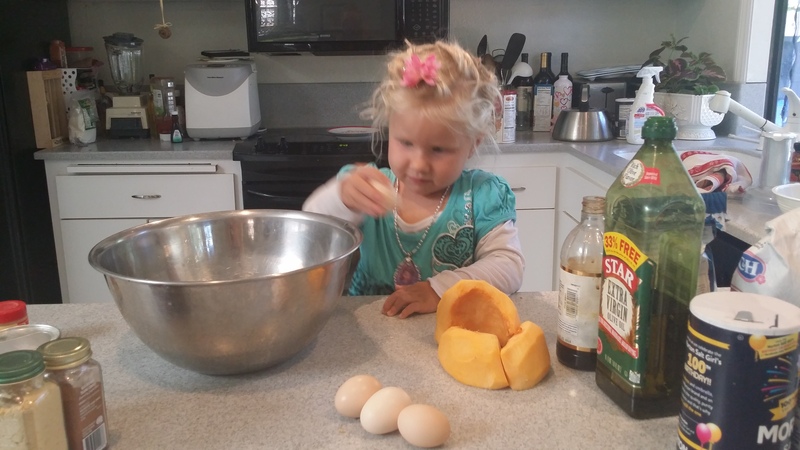 If you have a food processor, let your kids shred the pumpkin. It is so much fun for them to see how you put a big piece in and shredded parts come out. If you don’t have a food processor, don’t let your kids use a shredder, they might get cut. Once the pumpkin is ready you can move on to the batter. Give your child a medium bowl. 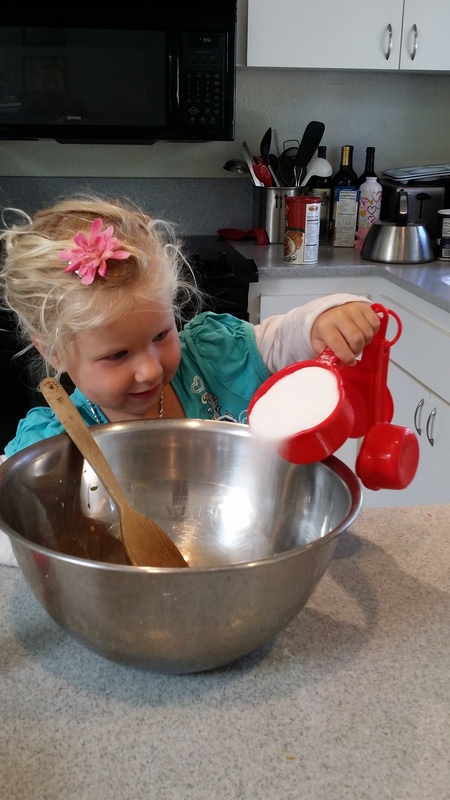 Let them use measuring spoons to measure the correct amount of the flour, cinnamon, ginger, baking soda, baking powder, and salt. Once all the dry ingredients are in, let your child stir it well together. 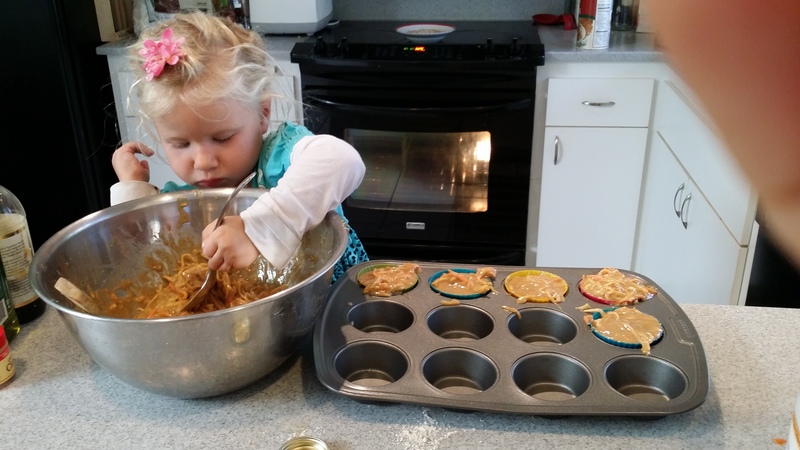 Give you child a large spoon and let him/her scoop the batter into prepared muffin pan. Bake for about 30 minutes. When the muffins are cooled down, you can take them out and Enjoy them with you Little Chef.